Income tax rates are one thing which every common man is worried about. The finance minister, P Chidambaram in his Budget 2013-14 kept the income tax rates unchanged. The table below shows the summary of tax slabs for FY 2013-14. The middle class with income of up to Rs 5 lakhs would receive tax credit of Rs 2,000 for FY 2013-14. This essentially means people with income up to Rs 5 lakhs have reduced tax burden of Rs. 2,060 for FY 2013-14. 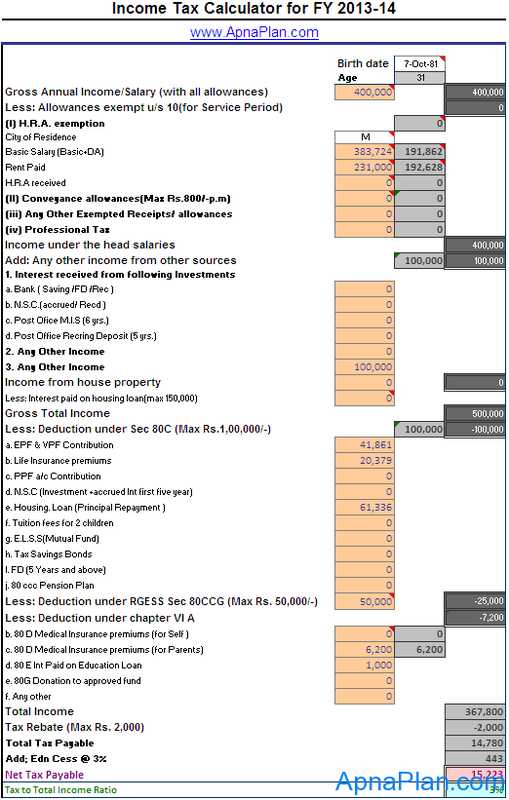 As we have done previously for previous financial years, here is the first version of the income tax calculator for FY 2013-14. This calculator is in Excel format and can be downloaded. This calculates Income tax only for people who have no losses/gains from House property or have a maximum of 1 House. I would try to incorporate these in the next versions of the calculator. You can also download Income Tax Calculator for FY 2012-13 and FY 2011-12 by clicking on respective links. This is how the calculator looks like. Cheers! It’s appropriate a chance to generate money for misfortune and it’s the right time to be happy. Hi, I am a female and my total income is Rs. 7,14,165. I plan to invest Rs.100000 under 80c. Can you help me with how much should be my taxes payable on my income, taking into account my category as a resident female and investments under 80c. Assuming that your total income is taxable and you would invest Rs 1 Lakh in 80C, you tax liability is Rs 54,418 for FY 2013-14. You can calculate it yourself too by downloading the tax calculator above. For saving more taxes you might want to look at the quick and easy guide to save tax for FY 2013-14. Finance minister Pranab Mukherjee has introduced Section 80TTA in the income tax act that will provide for deduction in interest on savings accounts with banks, co-operative societies and post offices. Under this section, the exemption up to Rs 10,000 is available on interest income from all savings bank accounts that a taxpayer might have in banks, cooperative societies or post offices. I overlooked it. Would correct it and upload the new version.